Forward-thinking hospitals are using Twitter and other like-minded applications to encourage real-time communication. No one can deny that we live in what has become a fast-paced, social media-driven world. Twitter—a status update service that allows users to post 140-character tidbits of information known as tweets—is among the leaders in fostering this lifestyle. Users worldwide update their Twitter feeds every moment of every day. In fact, as of May, 13% of adults online currently use Twitter, according to the Pew Research Center. This is up from only 8% in November 2010. The center also reports that 95% of Twitter users own a mobile phone, and one-half of these users access the service through their handheld device. “Twitter is a valuable resource. If you have a presence on Twitter, put out useful information, and respond to people … then it’s a good way to stay in touch with your patients and community,” says Ed Bennett, creator of the hospital social network list, which shows the number of hospitals that use social networking tools in each state. The list, which can be viewed at http://ebennett.org/hsnl, compares the total number of hospitals by state according to their use of YouTube, Facebook, Twitter, LinkedIn, Foursquare, and blogs. According to Bennett’s latest figures (updated in October), 1,220 hospitals have a combined total of 4,118 social networking accounts on various websites. “There are more hospitals using social media than are in my list. There are obviously some that I don’t know about yet,” Bennett says. Smaller hospitals (those with 50 or fewer beds), which comprise nearly one-half of the facilities listed in the American Hospital Association directory, likely don’t have the budget to initiate any type of social media or online outreach effort, he adds. Even though larger hospitals seem to be embracing social media, that wasn’t always the case, says Bennett, who also serves as the director of Web and communications technologies at the University of Maryland Medical System. In many hospitals, there is oftentimes a divide between the faster adoption of cutting-edge technology for medical use and the technology used for public relations and outreach purposes, he adds. According to Bennett, it wasn’t until the spring of 2009 when some hospitals really began to pay particular attention to Twitter. He attributes this spike to the mass media’s discussions about the application. “Suddenly, it was something everybody knew and was talking about. That’s when you got the highest growth curve for hospitals using it,” he says. The fact that Twitter and other social media tools come free of charge is appealing to hospitals, says Bennett. “None of these services cost any money. They’re all outside services. You don’t need to set up a server inside your IT department,” he notes. Bennett’s figures indicate that Facebook remains the most popular social media tool among hospitals. However, Twitter and YouTube aren’t far behind. He says Twitter usage may continue to grow, particularly because of the minimal impact it has from an operational and maintenance perspective. Still, Twitter represents a shift in terms of how hospitals communicate with patients, says Bennett. “We’re so used to the traditional one-way communication where we can just push out information through the regular media or marketing ads. But here the whole point of it is to be available for a conversation,” he says. Social media not only encourages conversation, it also transforms the way patients, providers, and researchers approach everything from wellness programs to chronic disease management, according to “Healthcare Performance Management in the Era of Twitter: Harnessing the Social Networking Phenomenon,” a report published by the Healthcare Performance Management (HPM) Institute in October 2010. Twitter—and social media in general—is increasingly having more impact in the healthcare arena, says George Pantos, executive director of the HPM Institute in Bethesda, Md. “Looking ahead, social media can play a major role in encouraging greater engagement in individual healthcare control and health behavior,” he says. “Twitter has just exploded this year for us,” says Jennifer Texada, communications program manager at MD Anderson Cancer Center in Houston. Although the organization had previously used Twitter—primarily for news and press releases—it recently began to expand its use by incorporating elements of patient education and outreach. For example, dozens of faculty members have individual Twitter accounts they use to raise awareness of clinical trials and provide treatment updates on a daily basis. For example, more than 7,000 individuals follow the Focused on Health Twitter page devoted to providing cancer prevention tips. Also, MD Anderson currently has 22 different department- and specialty-specific Twitter accounts, including ones for leukemia, minimally invasive surgery, melanoma medical oncology, inflammatory breast cancer, and proton therapy. Each of these accounts is managed by a different employee who responds to comments and questions. Texada says patients often ask how to find information about specific diseases or how to participate in clinical trials. The cancer center also hosts Twitter chat events that have proven to be effective patient education forums, says Texada. During the sessions, participants are invited to pose questions to experts in real time. Last year, an event on the changes in mammogram screening guidelines attracted 200 attendees. MD Anderson opted to launch multiple Twitter accounts rather than one central account because of the volume of information that each department/specialty wanted to publish, says Texada. However, it is challenging to ensure a consistent brand while managing multiple Twitter accounts, she notes. “Everyone was afraid we were going to lose control of our brand and our message. That’s why we started out really slowly,” says Texada, adding that newcomers to the technology should consider the same steady approach and examine how other facilities are using Twitter, including analyzing how they converse with patients. This will help hospitals gain insight into whether this avenue might be an effective communication tool, she adds. Scripps Health in San Diego, which has been using Twitter since early 2008, currently has more than 9,000 followers. “From the beginning, we recognized that ignoring social media outreach such as Twitter would be a missed opportunity. If we weren’t there listening, we couldn’t reach out to those talking about us,” says Ginger Anderson, a communications specialist at Scripps Health. The health system uses Twitter primarily to develop relationships with the community. To do so, it posts news and health articles that spark conversations and provide information, says Anderson. For example, as the official healthcare provider of the San Diego Padres, Scripps Health asks health-related trivia questions and awards free Padres tickets. The strategy seems to be working. During a heart health promotion, individuals posted questions on Twitter for physicians to answer. Within 48 hours, physicians responded to 10 questions, says Anderson. Anderson’s advice to hospitals that have recently launched an official Twitter page? “Perception is reality,” she says. Once hospitals understand the perception of their brand, they can use Twitter to best address the needs of their followers, she adds. While some hospitals are using Twitter to promote patient education and outreach, the University of Pittsburgh Medical Center (UPMC) is developing a Twitterlike application that will be more clinically focused and perhaps even have direct implications for patient care. The project, currently termed Trauma Team Texting (T3), involves an application that is loosely based on Twitter’s concept of real-time communication, explains Anthony DiGioia, MD, medical director of Patient- and Family-Centered Care (PFCC) Partners @ The Innovation Center of UPMC. The goal is to keep the patient at the center of the care experience, he says. 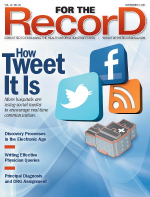 The application, which is still under development through UPMC’s Technology Development Center, mimics Twitter in that multiple specialists and care teams responsible for a patient’s care can “follow” that patient’s progress and order requests via an electronic application that is HIPAA approved. A password is required not only to access the device on which the application resides but also to gain entry into the application itself. How will it work? On admission, patients will be assigned an account within the application. From there, multidisciplinary care teams, caregivers, and staff assigned to a patient’s care can access certain types of information such as changes in the plan of care, pending physician order requests, and patient requests. The application will be accessible via computers—including those at the patient’s bedside—as well as smartphones or devices regardless of the carrier or type of phone/device. Accessibility via smart devices will be particularly helpful for physicians on rounds because they will be able to access real-time information while at the patient’s bedside, says Louis Alarcon, MD, medical director of trauma surgery at UPMC. T3 allows providers to read and respond to information as soon as they are able, which reduces the amount of time spent making unproductive phone calls, he adds. Messages posted in the application appear instantaneously and are archived in chronological order. Only direct care providers who are authorized to access a patient’s account will be able to enter information. “These are the people closest to the patients and who are most in tune with what the needs are,” says Alarcon. The T3 application will greatly enhance communication among specialists, says DiGioia. Typical exchanges, which often take place via phone or during chance encounters in the hallways, are often fraught with complexity and inefficiency and can lead to poor results, he adds. “Lack of timely communication and flawed transitions in care negatively impact not only the patient and family experience but also clinical and operational outcomes,” says DiGioia. Affected outcomes include pain and nausea management, medical errors, discharge planning, and length of stay. “So much of our day is spent just trying to coordinate and get a cohesive plan from each of the subspecialists,” says Alarcon. “It’s very labor intensive,” particularly in a busy teaching hospital such as UPMC, which admits approximately 5,000 trauma patients per year. The T3 project is partially funded by a one-year Always Events matching grant from Picker Institute, which advocates on behalf of patient- and family-centered care. PFCC Partners @ The Innovation Center of UPMC is one of 21 institutions to receive the grant, which supports hospitals in developing and implementing innovative processes that should be part of every interaction between a patient and a healthcare system. “The grants committee was impressed by the novel use of modern technology,” says Carolyn Marsh of Picker Institute, regarding why UPMC was selected. In addition, UPMC’s use of a somewhat familiar technology (ie, one that simulates Twitter) as well as its decision to deploy the technology on already-existing smartphones and devices meant that individuals using T3 wouldn’t need extensive training, she adds. Physicians are generally open to using new technology, particularly technology that improves patient care and saves time, says Alarcon. Examples of time-saving technologies recently deployed at UPMC include computerized physician order entry, e-signatures, and electronic documentation of progress notes. These technologies have all paved the way for the adoption of other types of more mobile technologies such as T3, he adds. Unlike Twitter, which limits users to 140 characters per post, T3 will allow providers to type an unlimited number of characters. However, providers will be generally encouraged to keep messages short and defer to more traditional methods of communication when necessary, says Alarcon. “Certainly, if there’s anything urgent, we wouldn’t use this system. We would use the standard face-to-face or phone call conversation. This is not intended to replace that. It’s intended to be a means for people to register their plans for the patient,” he says. For now, the application and its data will not be part of the EMR, says Alarcon. “We envision it as a tool for communication,” he says. In the future, UPMC may enhance the application by including the ability to add information from T3 as an attestation to a progress note. The application may also include the ability to initiate an electronic order. T3 version 2.0 will hopefully also extend beyond physicians to include nurses as well as patients and families, says Alarcon. “This is all about improving the experience for the patient. Our goal is not only to provide great medical care but also to ensure that the patients and families are actively involved in the whole decision-making process,” he says. UPMC is currently in phase 1 of the project, which involves trauma surgery and orthopedic surgery. The goal is to identify how communication occurs among physicians in each of these groups, including how long it typically takes physicians to respond to questions and whether this affects outcomes such as hospital length of stay. The actual T3 application will likely be deployed later this year or in early 2012, at which point UPMC will collect data for a discrete period of time, says Alarcon. During phase 2, UPMC will analyze how the application affects overall patient care. At the project’s conclusion, Marsh says the Picker Institute will produce a summary of lessons learned, a how-to guide for future T3 adopters, and a synthesis of tools and strategies used to promote and achieve T3. — Lisa A. Eramo is a freelance writer and editor in Cranston, R.I., who specializes in healthcare regulatory topics, HIM, and medical coding.